Congratulations on your engagement and upcoming wedding! You must be abuzz with excitement and ideas! We know your checklist is long and your questions numerous, so we’re here to make the paper process as pleasing as possible. 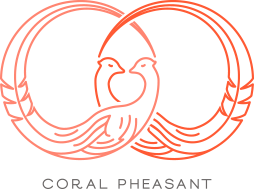 Coral Pheasant is your one stop shop for all things stationery. Below we’ve compiled a list of pieces that might be on your radar – and some you might not have even considered. We encourage you to inquire and share with us all of your wants and wishes for your paper story. We’re here to walk you through it! What’s it? Want it? Not sure if you need it? We got you! What is it? The first official annoucement to your people that you said yes! Do I need it? Yes if many of your guests are traveling or if your wedding is on a holiday weekend. What is it? The star of the suite. The invitation sets the stage and formally announces your wedding. Do I need it? Absolutely! You know this! What is it? A card your guests return to you indicating if they will or will not attend. Do I need it? Yes. Your guests response is needed to help finalize your guest list. What is it? A card that notes the time and location of reception. Do I need it? Only if the reception is at a different location than the ceremony and it’s not noted on the invitation. What is it? A card that helps guests know where to go. Do I need it? Directions are helpful! This information can be noted on your wedding website in lieu of a printed card. What is it? A card that lists room block information and/or local lodging for guests that are traveling. Do I need it? It’s a courtesy to help guide your guests. This information can be noted on your wedding website. What is it? A card that shares the link to your wedding website. Do I need it? A website card can eliminate the need for multiple enclosures by directing guests to get all the details online. What is it? A card sent to those invited to the rehearsal dinner. Do I need it? If you want to formally invite guests, then yes! It’s a great way for the person(s) who are hosting the rehearsal dinner to share those details. What is it? A patterned or solid color paper that lines the envelope. Do I need it? Not essential, but it is a delightful way to add color or pattern and interest to your suite. What is it? A card expressing gratitude for your guests’ attendance and/or gift. Do I need it? Emily Post would say absolutely! Write a note even if you have thanked the giver in person.